7 May 2010. 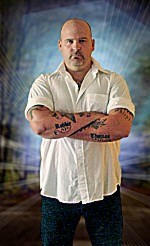 Robbie Thomas advertises himself as a "psychic profiler." Despite a report from skeptic Mark Edward that Thomas's Psychic Justice Tour had been cancelled, the tour is alive and well. About a month ago, Edward wrote that Thomas "has been given the boot by his promoter John Ramses, who turns out to have been put under quite a bit of stress and coercion short of being blackmailed by his one-time buddy." Maybe Ramses and Thomas have patched up their relationship. Maybe Thomas has a new agent. Or maybe he's doing his own publicity now. In any case, Thomas got Jeff Neumeyer of Indiana's NewsCenter, to post a puff piece advertising tonight's show in Fort Wayne, Indiana. The puff piece says that while in Fort Wayne, Thomas will "try and uncover new clues in the murders of Jeff Koop and Joesette Purcell, who burned to death in an arson fire Christmas Eve 1992." John Purcell, Joesette's father, is quoted as saying: "We're going into it with an open mind, and hopefully we'll get answers, and answers we need, and if not, we'll go to something else." According to Neumeyer, Thomas will also meet with the family of Sheila Wimes, who was found strangled in her southeast Fort Wayne home in 2001. What kind of man takes advantage of people who are still grieving and desperate 10-20 years after their loved ones have been killed? 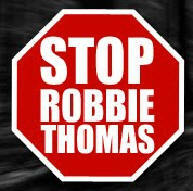 Robbie Thomas is your man. Despite Edwards's claim, he's still on tour and claiming to get messages from dead people too shy to contact their loved ones directly. His ads promise to reveal whether spirits truly exist, whether deceased loved ones can direct affairs in our lives to bring justice, closure and resolve, whether criminals can be named and arrested through direction by a deceased loved one, and how a true psychic profiler receives information from the other side. He even suggests that if you come to his show he might provide information about a crime you've been wondering about. His website suggests that he's especially good at finding missing children. Maybe he should get a scum of the minute award. Tickets for tonight's show at the Freemasons Hall in Fort Wayne are $40 at the door. He promises he "will be doing a live cold case reading on the untimely death of Joesette Purcell with her family in attendance on stage." He'll be doing a cold reading, you can be sure.